The investigating students, known as the Buzz Bunch, will collect a wide range of bee-related data, including factors affecting their survival, population dynamics, diet and community awareness. Senior teacher Kate Harden said 50 students are involved in the environmental sustainability program that “extends from the school grounds to the rest of Australia”. 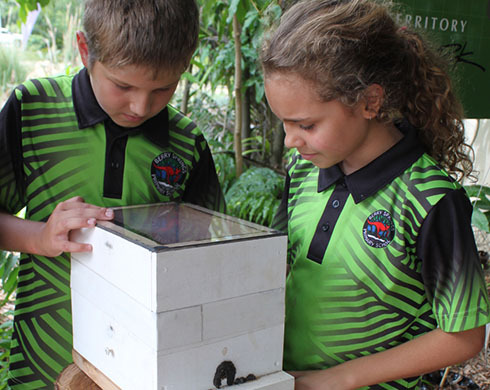 “The Year 3/4 students are contacting beekeepers throughout the nation, developing an interactive map on which to mark their locations, the types of bees they keep, the number of hives they manage, climatic conditions and bee survival threats,” she said. “Among our many aims are the establishment of a native bee colony at school, the creation of a bee friendly garden, the propagation of bee food plants in partnership with the Territory Wildlife Park, the construction of different styles of bee houses, and the production of a bee cookbook highlighting foods made using honey. “Towards the end of our award-winning Atlas Moth research project we conferred with the Territory Wildlife Park to see what other environmental issue we could investigate and raise community awareness about. Picture: Kooper and Isabella inspect a native bee hive at the Territory Wildlife Park.